We wake up in the Hilton at 6:30 am after a reasonable nights sleep. This is the first REAL day of our holiday because we will arrive in Orlando today. Our flight is not until 12:30 so we have some time to relax. Down to the health club for a display by the Stringer synchronised splashing team. The pool is a reasonable size and the facilities are good. On to breakfast which we get free as part of the room cost. There is a good range available including cereals, fruit, Continental and English breakfast. Back to the room where we pack our overnight bag. So its now 9:00 am and we have been swimming, had breakfast and are now ready to head out for the airport. What are we going to do for the next 3 and a half hours? The horrible possibility of a shopping spree begins to creep into the darkest recesses of my mind. Across the walkway to the airport and we walk past the Virgin check-in desk to gloat at the people waiting in line. We are shocked to see that there is no queue at all! And they got to miss Mr Grumpy! Accessorize  Oh, I just need to pop in here. Boots  Oh, I just need to pop in here. Monsoon  Oh, I just need to pop in here. Much more of this and Ill be doing some popping of my own. Is steam coming out of your ears a sign that you are relaxed and ready for a 9 hour flight? Through to the departure lounge where the pain continues. A watch for India, a comic for Georgia and perfume for Tam. Ill admit that I get some aftershave (Burberry London) so I cant complain really. The flight boards on time and Tam is lucky enough to have the full search. They even make her take her shoes off. That must be a lovely job, searching peoples smelly shoes. We take off on time and an hour or so in I watch my first film, Chicago. What is it with musicals on flights to Florida? Last time I watched Moulin Rouge. I half expect to see the flight attendants to break into song and dance. Mind you, if they looked like Catherine Zeta Jones (Douglas?) in stockings, this would not be an altogether bad thing. I have to say that I think that Moulin Rouge is the better movie, although Chicago is pleasant enough and must be something special to see on-stage. The second film is Catch Me If You Can. Now that is my sort of film. I like Tom Hanks and Leonardo DiCaprio is excellent in the lead role. Just shows what you can get away with if you have enough front. Its the same approach Ive been in trip report writing for years. I have also just discovered that Virgin have one audio channel playing nothing but Clash songs. Now THATS cool. The flight is very good and we land in MCO 30 minutes early at 4:00pm. I seem to be able to put up with the flight much more easily than I used to. Perhaps it is because I am getting used to it. I ought to be, this is our 9th time! Things dont go entirely smoothly from this point on. Firstly the added security checks add a few minutes and then we have to wait for our luggage at the second baggage reclaim. Two of the cases come quite quickly, but the third fails to turn up. In the end there are about 4 families left waiting for a suitcase each. The worst thing of all is that its the suitcase containing all MY clothes thats missing! I have visions of me wearing the clothes that Im standing in for the next 2 weeks. I would still look devastatingly attractive of course, I just wouldnt smell so good. To a huge sigh of relief the case finally turns up and we head off to find Happy Limo. They are nowhere to be found, but a nice chap that works for the airport rings them for us and they say they will be there shortly. 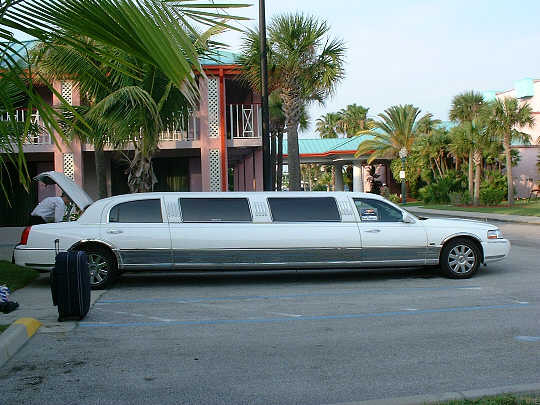 The girls still dont know we are going in a stretch Limo. As it pulls up I say Wouldnt it be nice to go in something like that one day?. Nods of approval from India and Georgia. Well, todays that day. The girls faces are a picture. Chris from Happy Limo takes care of all the luggage and insists on opening and closing the door for us. We eventually pull away from the airport 2 hours after landing. I dont care really. Im on holiday. .. its so big it would even contain MY ego! Now THIS is definitely the way to travel! Cold beer, cool rock and space to spare. The journey to the Radisson at Port Canaveral goes too quickly. Chris lets us check in and then drives us round to our room. First impressions of the Radisson are that its nice. As Tam says, a couple of years ago we would have said that its wonderful, but we have been so spoiled by the DVC that nice is all we can manage. The bags are dropped off and its straight to the pool for the girls to have a splash. They are holding up very well considering it is now midnight UK time. The pool has a rock formation over it with a stone panther stood on top. I look up to see the strange sight of a bird sat on the panthers head. Ive never seen that before even in my more surreal drunken moments. Back to the room where we change and head out to the restaurant next door. Its called Kelseys and is an Italian place. Im too tired to report exactly what we had to eat, but it included a pitcher of beer and came to $45 with tip. Not bad at all. I have to admit shamefacedly that Tam produces an excellent effort on the beer front. At one time she is in front of me by nearly a full glass. However, this is not a sprint and I have caught up by the end. Georgia falls asleep straight after she has eaten, so its time to head back to the room and into bed by 9:30 pm. When asked to comment on the day India says The Limo was great and Georgia says Night night.